I cannot tell you how much I enjoy work meals. Celebrating a new employee, company event, networking socials – They all give me the opportunity to try food at places I’d never go on my own (because I can’t afford it). Boulevard has been on my hit list for quite some time and I finally had the opportunity to try it a couple weeks ago. Aside from the appetizer, I was very much impressed with the food and service. I would love to come again to try other items on the menu. The restaurant has an old-fashioned, classic feel. It is built in the beautiful Audiffred Building, built in 1889 and is one of San Francisco’s oldest buildings. Service is outstanding. The waiter came by several time to check on our meal and continued to fill our water glasses. Everything had beautiful presentation. The food really comes to life when it is presented. Ahi Tuna Tartar – Although displayed beautifully, I could not enjoy this dish. The tuna was mixed with A LOT of minced raw ginger. I cannot bite into ginger. Something about the texture and the over-powering flavors overwhelms my palate, leaving my mouth feeling tortured. I also could not eat the green onion tempura, again pretty, but I found no interest in eating an onion. 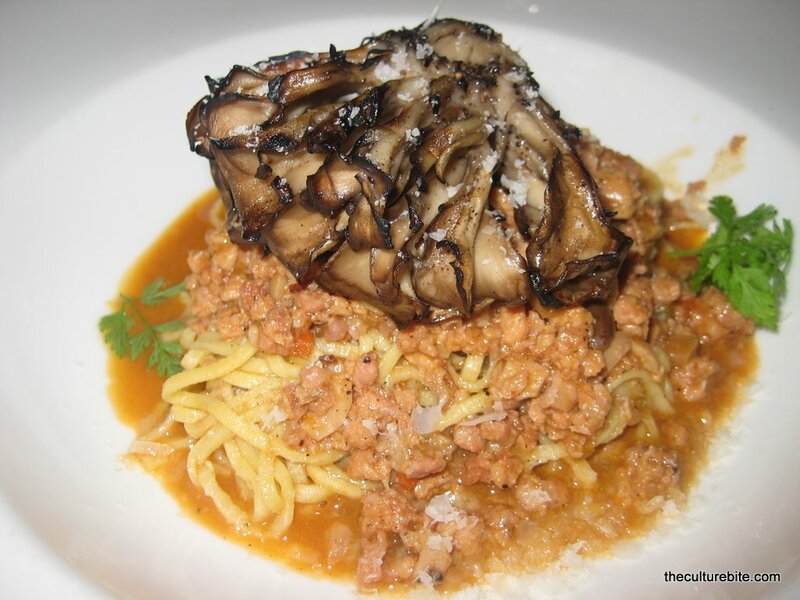 Rabbit & Porcini Mushroom Bolognese housemade linguine, grilled maitake mushrooms, parmesan cheese – This was ah-mazing! The pasta was so fresh and al dente and the sauce was rich and hearty. I’ve never had rabbit before that day. It tasted pretty much like chicken, but it had the texture of ground pork. The thin, fresh linguine pasta had the sustenance to hold velvety tomato sauce and the bits of ground rabbit. The mushroom on top was so tender and delicate, you could break it apart with a fork. Peanut Butter Ice Cream Bon Bon – We most definitely could not skip out on dessert. Although full, we figured we had room for a tiny dessert. The bon bons are made of a rich peanut butter ice cream and covered in a thin layer of milk chocolate. How can you go wrong? Passion Guava Lemonade – The lemonade came in a tall skinny glass and the bright pink color was absolutely beautiful. Drink was very fresh and tasty, but I’d be scared to know how many calories was in it. This is definitely an “occasion” restaurant, so I’ll wait for the next occasion to try it again. I can’t wait!